Americans spent more than 53B minutes -- about 100K years -- in May 2011 on Facebook, where they spend more time than any other site, according to a Nielsen study. Facebook's own stats claim 700B minutes a month, indicating that the U.S. audience is just a small slice of its overall popularity. Facebook says it has more than 750M members worldwide, and more than 250M active users access Facebook on their mobile device. In a distant second place was Yahoo with 17.2B minutes [ see our Yahoo editorial ] followed by Google, Aol and MSN/WindowsLive/Bing. With just 565M minutes, Twitter did not crack the top 10. Twitter has more than 100M active monthly users [ see our story ]. Nielsen's "State of the Media: The Social Media Report" says that four out of five active Internet users visit social media sites. In the U.S., social media use is responsible for 22.5% of all time spent online and online games 9.8%. Facebook has maintained an average growth rate of about 20M new users per month, but in May 2011 Facebook reportedly only grew by 11.8M, according to Inside Facebook. From May to June the largest increase in Facebook users came from Brazil, which experienced a 10% growth of 1.9M users. But the largest share of Facebook visitors come from Europe, according to comScore. Launch has contacted Facebook for a comment regarding the Nielsen report. 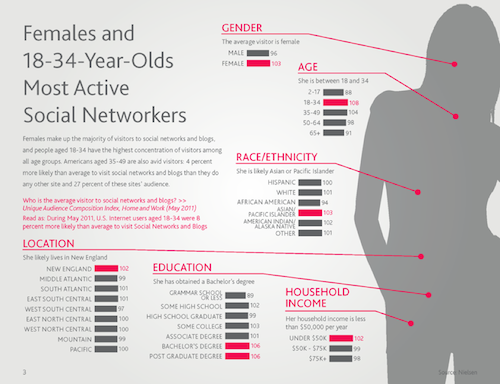 The Nielsen study's other findings: females and those between 18 and 34 are the most active users of social media. Additionally, 40% of social media users access the content through a mobile device -- social networking apps are the third most-used application in the U.S.
Twice as many people 55+ accessed social media through a mobile device than since Q3 last year. Social networking app usage is up more than 30% from the same time period. In stating the ridiculously obvious, Nielsen's Radha Subramanyam told the New York Times, “Social media is becoming increasingly mainstream." See more discussion on Techmeme.com.